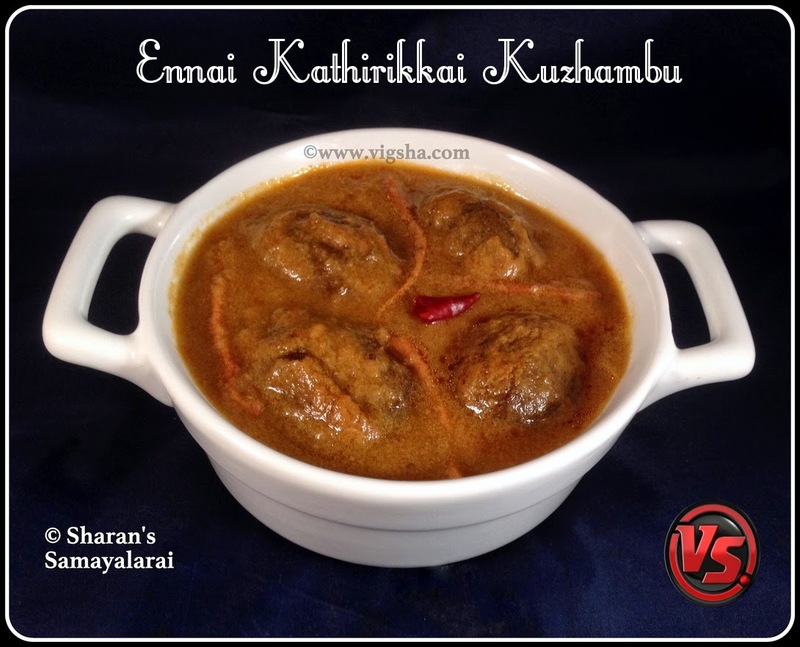 Ennai Kathirikkai Kuzhambu is an authentic South-Indian Kuzhambu recipe. This delicious kuzhambu makes a great rice accompaniment. I am posting my mom's version. Brinjal | Eggplant is very low in calories and fats but rich in soluble fiber content. It contains good amounts of many essential B-complex groups of vitamins such as vitamin B5, B6, B1,B3. 1). Wash the brinjals and slit from bottom, halfway towards top letting them hold the pieces together (see the below pic). Make sure the stem is intact with the brinjal. Keep them immersed in water until use so that they do not change color. 2). Heat oil in a pan, add cumin, red chillies, channa dal, curry leaves and onions. Saute till the onions turn light brown and switch off. Let it cool and then transfer to mixer. Grind it along with salt, grated coconut, coriander powder, turmeric powder and tamarind. Add little water and grind it to a fine paste. Keep aside. 3). Heat oil in a pan, add mustard, curry leaves and let it splutter. Then add the brinjal and tomatoes, saute till the tomatoes become mushy and brinjal slightly shrinks. 4). Add the grounded paste along with a cup of water and let it boil till the brinjal is fully cooked. Check for salt and add if necessary. Cook till the gravy thickens and oil floats on the top. 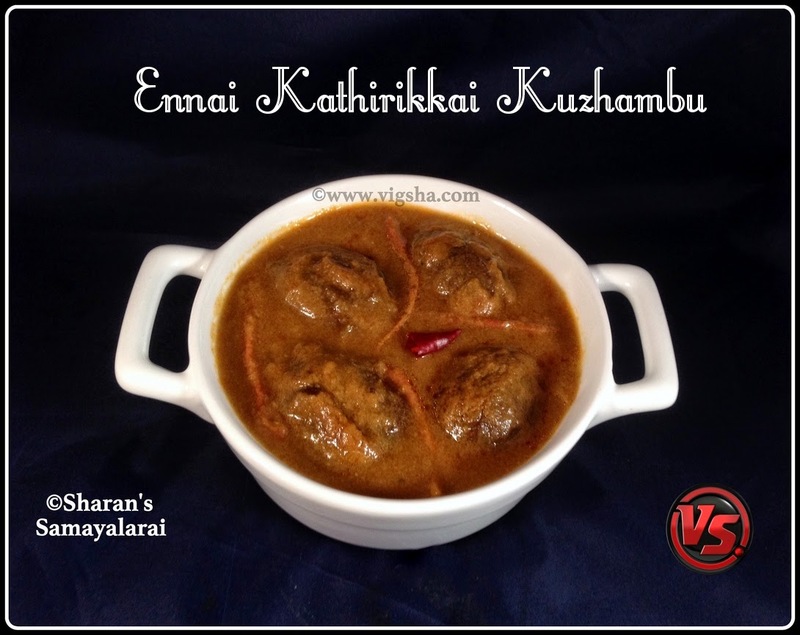 Flavorful Ennai kathirikkai Kuzhambu is ready and serve hot with steamed rice and appalam. # Tender | baby brinjals are well suited for this gravy. # Use Shallots for the best taste. How ever it can be substituted with big onions too..
Hi Sharans, wow delicious egg plant curry. Thanks for sharing the recipes. very authentic kuzhambu dear... my gradma's favorite..
that looks delicious..... thanks for stopping by. Many are complaining about my follower link not working. Pls try and add me after sometime.